Jane Austen (1775-1817) is one of the most famous authors in the western canon (possibly helped along by a certain well-known Colin-Firth-diving-into-a-pond scene in the BBC Pride and Prejudice television serial adaptation). And our fascination isn't just with her works: it's with the woman herself. There are countless biographies, a museum, websites, and films: Miss Austen Regrets, Becoming Jane, and, I would argue, the 1999 Mansfield Park adaptation, wherein Fanny Price has more in common with her spirited author than with the rather prudish and timid heroine of the novel. Jane Austen was born into a family of lower gentry in Hampshire, where her father was Rector of Steventon. 16 December 1775. She had seven siblings: six brothers (five older, one younger), and an older sister, Cassandra. Cassandra and Jane had a relationship not unlike her sister characters Jane and Elizabeth or Elinor and Marianne: that of both best friends and confidantes. In 1801 her father retired and they moved to Bath. In 1783 (Jane was eight, Cassandra ten), the girls were sent to Oxford to live with their cousin and be tutored by Ann Cawley, widow of a Brasenose principal. When the girls caught typhoid fever, they were brought home. In 1785 they were sent to a boarding school in Reading, Abbey House School, but the family could only finance their attendance for one year. After that, the sisters learned from her father and his impressive library. In the summer of 1788 the girls visited their father's uncle and patron, Francis Austen. Writings of their cousin Phila survive. Phila thought Cassandra delightful, but Jane 'not at all pretty', 'whimsical & affected', and altogether too noisy. Jane was only twelve. After her return from boarding school, Jane likely began writing. Among her surviving early works are Love and Friendship, an epistolary novel parodying novels of sensibility, and The History of England, a parody of Oliver Goldsmith's 1764 History of England, dedicated to Cassandra and self-proclaimed to be 'By a partial, prejudiced, & ignorant Historian'. The work is bitingly funny. The opening to her paragraph on Henry VI reads, 'I cannot say much for this Monarch's Sense. Nor would I if I could, for he was a Lancastrian'. Cassandra, an avid artist, painted watercolour illustrations for the book. Most of Jane's other novellas, plays, and sketches depicted confident and clever young women. Her major influences included the works of Samuel Richardson and Frances Burney. She titled Pride and Prejudice for a quote in Burney’s Cecilia. Click for Professor Kathryn Sutherland's podcast on Jane’s early novel, The Watsons. In 1793 and 1795 Jane began work on 'Elinor and Marianne', the book that would become Sense and Sensibility. She may also then have written Lady Susan, which was never published in her lifetime. In 1794 Cassandra accepted the proposal of one of her father's former tutoring pupils, Thomas Fowle. Fowle became chaplain of a military expedition to the Caribbean, where in 1797 he died of yellow fever. In October 1796 Jane began writing Pride and Prejudice, originally entitled 'First Impressions'. Jane was twenty-one, the same age as Elizabeth Bennett. She finished in 1797, and though her father offered it to a publisher, it was rejected. Jane returned to 'Elinor and Marianne', now Sense and Sensibility. According to Cassandra, between 1798 and 1799 Jane wrote Lady Susan, which would be published posthumously as Northanger Abbey, a parody of the Gothic novel containing a heroine the likes of which Jane had read in the works of Ann Radcliffe. Benjamin Crosby & Son accepted Susan: A Novel for publication, but after they refused to publish the work, in 1809 Jane bought back the manuscript and publishing rights. Sometime before that Jane changed the title and the character's name to 'Catherine'. 1801 marked the disruptive move to Bath, the upset of which rather curbed Jane's literary productivity for a while. In November 1802 Jane and Cassandra stayed with their friends Catherine and Aletha Bigg at Manydown Park, north of Basingstoke. A week later Jane accepted the marriage proposal of their younger brother, Harris Bigg-Wither, a man of considerable financial means. The twenty-seven-year-old Jane was unlikely to receive another proposal. The next morning, for reasons unknown, she retracted her acceptance and the girls returned to Bath. 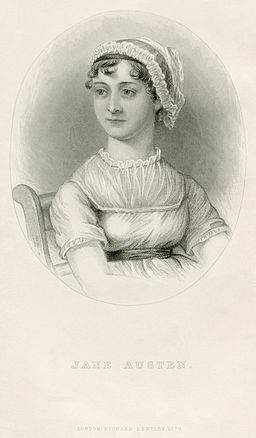 On 21 January 1805, Jane's father died, leaving the three women– Mrs. Austen, Jane, and Cassandra– with an income of only £210 a year. Though the brothers contributed as best they could, the new reduction in financial status was difficult for the Austen women. They stayed with friends, then with Thomas Leigh at Stonewall Abbey, then Steventon Rectory after Jane caught whooping cough. They moved in with her brother Frank in Castle Square, but only in 1809 did they finally find a permanent home in Chawton, Hampshire. And it was there that Jane became a published writer. In 1811 Sense and Sensibility was published in three volumes, with Jane herself paying for the cost of publication. It was an instant success, with the full print run of 750 selling out by 1813. In the fall of 1812 Jane sold the rights to Pride and Prejudice for £110, by which point she had begun writing Mansfield Park which was published in 1814, likely with an impressive print run of 1250. The novel made her more money than any other in her lifetime, more than £320. Jane Austen dealt masterfully with many themes, some traditional, some more daring, including love, social class and classism, the financial and social vulnerability of young women, family, and human folly (See a comic take on Austen’s darker themes here). That she did not discuss politics despite the Napoleonic Wars is an interesting indicator of how little the private and public spheres overlapped for women of the period. Her nephew Edward Austen-Leigh wrote of how impressed he was with her decorum in always hiding her work and the fact that she wrote for publication, since female novelists were still often considered lewd and indiscreet, a hangover from the reputations of the likes of Aphra Behn and Eliza Heywood. In 1816 Jane completed Emma, begun in 1814. Jane and her brother Henry were responsible for negotiating prices for the copyrights of her novels with printer John Murray. Murray overestimated the potential success of Emma and printed to big a run, producing an initial loss and very little profit for Jane during her lifetime. Though Emma is often considered her greatest work and Jane thought Emma her favourite of her heroines, she did write, 'I am going to take a heroine whom no one but myself will very much like'. Jane wrote of her intentions to write at least three more novels while at Chawton, wanting to attain financial independence of relatives for herself, her sister, and mother. In 1816 she finished a draft of 'The Elliots', later to be titled Persuasion. However, that year Jane fell ill. Retrospective diagnosis suggest she had Addison's disease or Hodgkin's lymphoma. Though the next year she began writing 'Sandition' she never finished it, and on 18 July 1817, Jane died. After Jane's death, Cassandra and Henry arranged the publication of Persuasion and Northanger Abbey and with those 1817 publications, Henry wrote a eulogy published alongside the books identifying Jane as the author of all of her novels. Cassandra allegedly destroyed many of Jane's letters and manuscripts that Cassandra thought would reflect poorly on Jane. Nonetheless, many of Jane's witty personal letters remain, which provide a great deal of the bibliographical information included here, and offer a delightful character sketch on the beloved writer. Neither Jane Austen, the creator of the brilliant stories of courtship, nor her sister ever married. Click for Prof. Kathryn Sutherland’s podcast on Jane Austen's manuscripts and what they reveal about her life and her writing. Cite:The Anonymous Jane Austen by Kate O'Connor at http://writersinspire.org/content/anonymous-jane-austen. Accessed on Wednesday, April 24, 2019. If reusing this resource please attribute as follows: The Anonymous Jane Austen at http://writersinspire.org/content/anonymous-jane-austen by Kate O'Connor, licensed as Creative Commons BY-NC-SA (2.0 UK).